Hello dearies! Here it is, one of the grandest giveaway that I have to date. 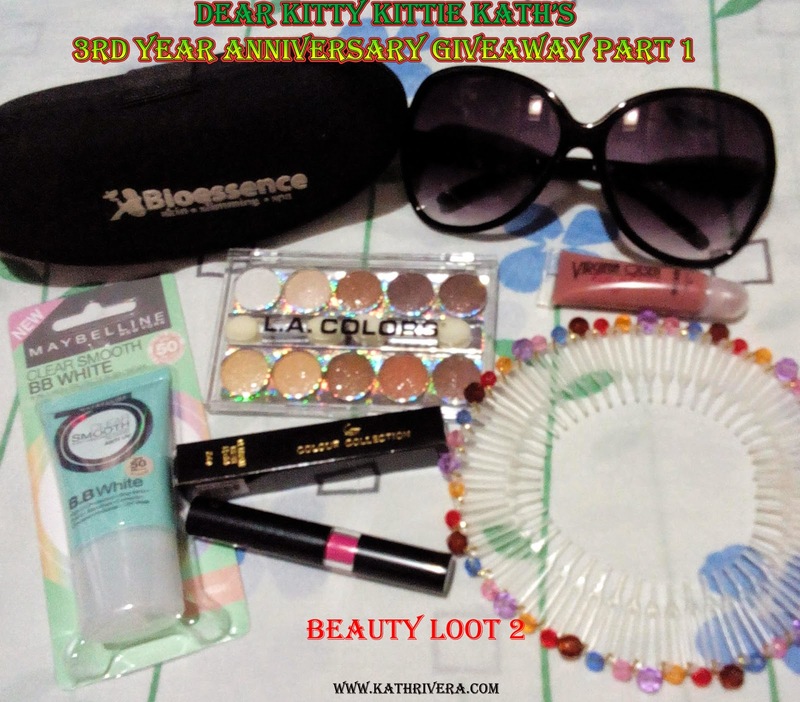 I'm bringing you Dear Kitty Kittie Kath's 3rd year Anniversary Giveaway Part 1!!! Yes, this is the first part of the giveaway, there will be second next week so stay tuned for that. 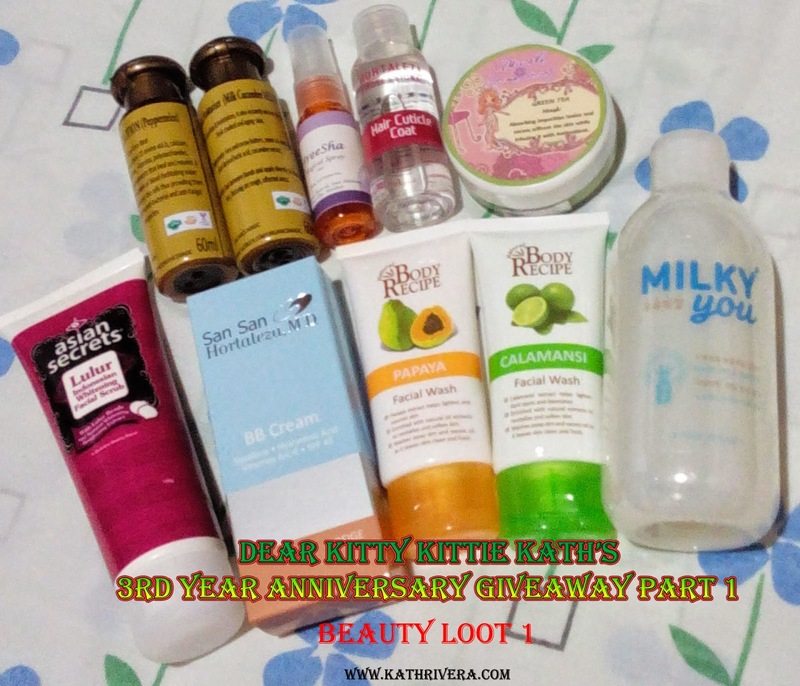 Time flies so fast, like what I've said on my first and second year anniversary giveaway posts, blogging became an outlet wherein I share my experiences; good and bad about the products that I'm using everyday. I'm so happy that you appreciate my effort in all my product reviews because of your comments and suggestions. I'm so thankful for all the visits and for joining my monthly giveaway. I would also like to thank all my sponsors, for the trust and never ending support :) I'll make a short but sweet speech on the next part of this giveaway. But for now, keep calm and join the giveaway! I will be very strict in verifying the entries. As always, please play fair. SET ALL YOUR POSTS IN PUBLIC. Log all your entries in the rafflecopter below. You have to give all mandatory tasks and after that you'll unlock bonus points that will increase your chances of winning. So for additional notes, about the giveaway click CONTINUE READING and smile! The mechanics are simple and easy just follow all the instructions on the rafflecopter app. Please SET ALL YOUR POSTS in PUBLIC. There will be two (2) winners for this giveaway. TAG your friends's active Facebook, Twitter or Instagram accounts. Happy 3rd Anniversary! God Bless! Thanks for this giveaway! Thank you for the wonderful opportunity Ms. Kath. I already received my prize and I'll tag you soon on my post :) Again, Thank you and God Bless , More Power and More giveaways for you to share to us- YOUR READERS.